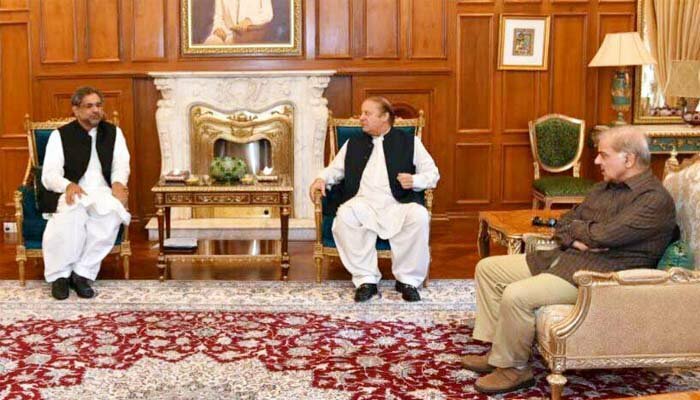 ISLAMABAD: Prime Minister Shahid Khaqan Abbasi and Punjab Chief Minister Shehbaz Sharif met their party’s supreme leader, deposed premier Nawaz Sharif on Wednesday and “advised” him not to escalate confrontation with the military establishment, hours after the latter announced that he will now name those responsible for the 2014 sit-in. According to reports, Abbasi and the younger Sharif ‘advised’ Nawaz to refrain from issuing harsh remarks against the establishment. The move came after the deposed PM refused to retract his remarks on the Mumbai attacks and is now reportedly digging in his heels over requests for rapprochement with the state institutions. Talking to reporters outside the accountability court after attending the Al-Azizia corruption reference hearing, Nawaz said “everything will be revealed soon”. The former PM was asked whether the two parties — Pakistan Tehreek-e-Insaf (PTI) and Pakistan Awami Tehreek (PAT) — had staged the protests themselves or were ‘directed’ to. Interestingly, Nawaz dodged a question regarding the support of his younger brother, Shehbaz. Nawaz was asked whether Shehbaz is with him, but he chose to ignore the question. Shehbaz is the chief minister of Punjab and took the reins of the party after Nawaz was barred by the Supreme Court from holding party office due to his disqualification from Parliament in the Panama Papers case last year. Soon after the deposed PM returned to Punjab House from the judicial complex, PM Abbasi and Shehbaz Sharif called on him. Sources said that Nawaz refused to budge from his stance, and the two senior PML-N leaders had to return empty-handed. According to media reports, the former PM is annoyed with PM Abbasi for not voicing support for him when the declaration of the National Security Committee (NSC) meeting regarding the Mumbai attacks was being drafted. “Nawaz expressed his annoyance when Abbasi met him on Monday to take him into confidence regarding the press release that was to be issued from the NSC forum,” said the report, adding that Abbasi held the press conference to ‘balance the equation’ in a bid to appease Nawaz. In the same presser, the premier denied that NSC condemned Nawaz’s statement, saying the meeting ‘actually condemned Indian media’s propaganda’ and misreporting in the media. The NSC had unanimously rejected all the allegations and condemned the fallacious assertions raised by the Nawaz Sharif regarding the 2008 Mumbai attacks. The Shehbaz-led PML-N had also termed Nawaz’s remarks against the party policy, but Nawaz continued to stick to his stance. His remarks were immediately picked up by Indian media, which termed the former prime minister’s statement as a confession of Pakistan’s role in the Mumbai attacks that left 166 people dead.